Ministry of Propaganda - 02/Dec/2004: "First Steps"
When I woke up this morning it was quite foggy, so I wasn't too optimistic. When I left from Carlisle it was still foggy. When I crossed the border it was foggy. Then it started to clear up and I had some nice sunshine. Only to turn to fog again once I reached Glasgow. 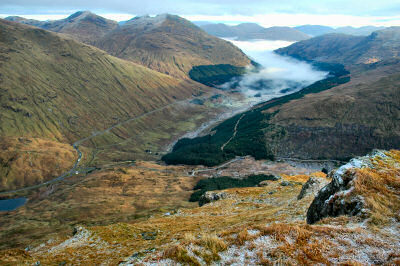 I decided to continue, although I had my doubts when Loch Lomond was hidden in fog as well. But the decision to drive on turned out to be right: When I reached Glen Croe the fog lifted and I had some clear blue skies. I stopped at Rest And Be Thankful, where I quickly changed. And then I was off into the hills. I only had about 3.5 hours until I expected it to get dark. Hence I set my myself a time limit, after which I would turn back. I almost made it to the summit of Beinn an Lochain, but as I was running out of time I only made it to one of its lower tops. Nevertheless I had great views over Glen Croe and over to the Arrochar Alps, in particular The Cobbler and Beinn Narnairn. It was fairly cold, what you can see in the picture is some frozen fog from earlier in the day. Some of the rockier bits on the summit were quite slippy, so I had to be careful where I walked. No snow though, at least not yet. 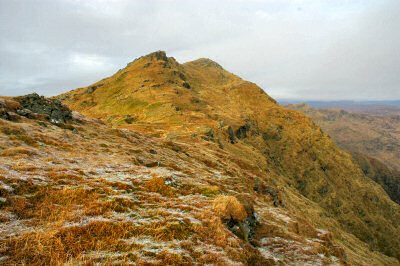 I believe the forecast for tomorrow is quite good, so hopefully I can have a go at getting up Ben Vorlich. Depending on when I get back and how tired I am there might be another update tomorrow. Or Saturday. Or Sunday. Or not until Monday.